Monochrome photograph of the Dornoch Hotel (was known as the Station Hotel) from the Basil Hellier postcard collection. 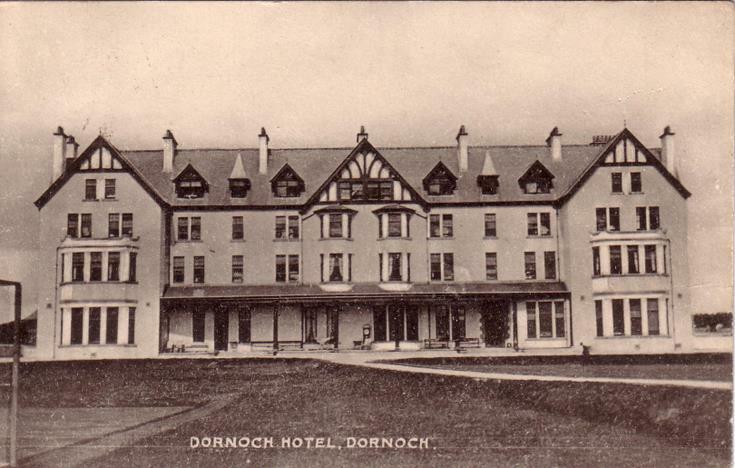 There is a central title at the foot 'Dornoch Hotel, Dornoch'. This very plain photograph is in stark contrast to the line drawing (which may be viewed using the previous links above) which shows flower beds on the lawn and lining the path in front of the hotel. The reverse of the postcard has an address in Hooton Cheshire and bears a red one penny George V stamp. The message on the postcard refers to a return home 'tomorrow' indicating the speed with which postcards were delivered.